Mecalux has supplied pallet racking for DFS being the UK largest sofa retailer and Dwell the design lead furniture retailer. The warehouse, located in Milton Keynes (north of London), can house more than 22,000 pallets. Dwell & DFS partnership represents the joining of two enterprises that produce indoor furniture, as well as home décor products, and who have partnered up since 2014. Fame and prestige have followed this business merger in its sector within the UK. Dwell started up in 2002 and flourished via the sale of interior design items and furnishings. Meanwhile, DFS was founded in 1969, emerging some years later as one the most important companies in the sector in Great Britain. Mecalux installed 24 double-depth pallets racks and one single-depth unit, with a capacity for more than 22,000 pallets 1,000 x 1,200 x 1,500 mm in size with a maximum weight of 1,000 kg each. This system fulfils the storage demands of Dwell & DFS, since it gives operators direct access to multiple SKUs, streamlining the preparation of orders. The ability to house loads of different sizes is another of its advantages. The racks, 81 m long and 12 m high, feature eight storage levels. Its extended length and height result in significant leveraging of the available space. The picking of full boxes is carried out directly from the pallet on the first level or from the wire mesh shelves set up in one part of the warehouse. These shelves are only used for low demand merchandise. 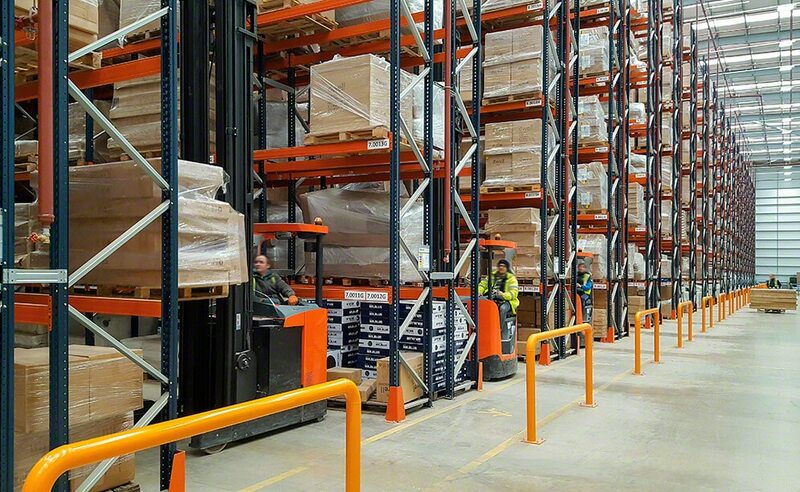 Reach trucks in operation handle the pallets in aisles that are less than 3 m wide. The fork on the forklift is fitted with a camera to ease loading and unloading movements. Thanks to this system, the goods are placed precisely and workflows are speedier. The operator views the movement and direction of the forks on a screen when handling the merchandise. Between the loading docks and the pallet racks, a zone is enabled to deposit pallets on the warehouse floor classified by shipping routes. These pallets are held in standby while waiting to be loaded into the lorries. High load capacity: given the length of the aisles and their height, Dwell & DFS warehouse can locate more than 22,000 pallets. Streamlined picking: the pallet racks offer quick access to the stored goods. Top security: the cameras fitted onto the forklifts facilitate handling at heights and make for a more secure installation.